Want to honeymoon in the Caribbean? The tropical island of Jamaica has many all-inclusive options and is the perfect choice for your honeymoon destination. Jamaica will offer you a variety of activities to fill your memory bank with unforgettable experiences; from relaxing beach days in the calm waters of Montego Bay to stunning sunset dinners in Negril. 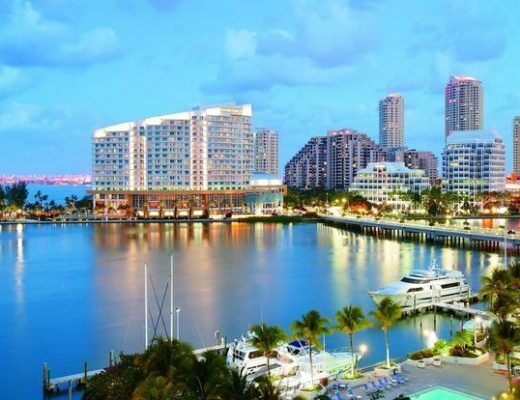 Begin the planning process by browsing through the variety of regions and resort options. Our expert specialists can help narrow down the perfect spot for you based on your budget and preferences. Although Jamaica may seem like a small Caribbean island, there are many regions to choose from, all with a different personality. The shores of Montego Bay welcome honeymooners to enjoy endless sunshine as they begin their new chapter together. There’s plenty to do and see, whether it’s a tour of Rose Hall Great House, rafting on the Martha Brae River, or spending a day at Croydon Plantation. The city’s location on Jamaica’s north coast combined with warm tropical climates create the perfect blend for hours on the beach. A sun-kissed honeymoon in Montego Bay can do no wrong! The beautiful resort town of Negril is the perfect destination for couples looking to have an authentic honeymoon. You’ll be spoiled with the bright blue waters and golden sands of Seven Mile Beach for picture-perfect beach days. If you wish to explore, you can do so by snorkeling, scuba diving, and more. Plus, Negril is home to a wide selection of beach resorts varying in size so you can choose the right one for your Jamaican honeymoon! Couples who love a good adventure will find Ocho Rios to be filled with thrilling excursions and outdoor activities. Popular attractions like Dolphin Cove, Mystic Mountain, and Dunn’s River Falls are great ways to see some of Jamaica’s striking beauty. Continue your ventures on an ATV ride through the area’s landscape before seeking some mouthwatering Jamaican coffee to try. If you need a break and want something low-key, shop for a couple of souvenirs to take home with you as reminders of your island getaway! The experience to be had in Runaway Bay is even better when you enjoy them as a newlywed! This secluded area is ideal for couples who want a quieter atmosphere, but can still have a good time. You’ll be struck by natural sites such as Green Grotto Caves and Cardiff Hill Beach. Lively evenings feature rhythmic music that will have you dancing all night long and exotic flavors are enough to satisfy your appetites, no matter how big. And since Runaway Bay is surrounded by a large coral reef, snorkeling and scuba diving are excellent opportunities to explore the underwater community! Romance is the name of the game when you honeymoon at Couples Swept Away. The breathtaking beauty of Seven Mile Beach sets the scene for a magical getaway with your special someone. Celebrate your new beginning with a complimentary bottle of sparkling wine followed by a 25-minute couples’ massage. Have your room decorated with rose petals and candles for added moments of passion. Plus, Romance Packages enhance your stay to create some of your favorite memories together as you delight in paradise. If luxury is at the top of your honeymoon requirements, then Sandals Ochi Beach Resort is your match! Newlyweds can expect top-notch service and treatment designed to make their stay perfect. Enjoy total privacy, a relaxed atmosphere, and striking views in your Love Nest Suite®. Sip on a drink from your in-suite bar out on your balcony or patio. Plus, the resort’s butler service is available to meet your needs so all of your honeymoon dreams come true. Let the romance continue beyond the comfort of your suite. Take to the spa for a soothing couples massage or book a private candlelit dinner for two. You can also explore the Caribbean on an island journey to give you some of your favorite memories together. Everything you could want in a beachfront honeymoon exists at Royalton Negril Resort & Spa! The Honeymoon Package is complete with romantic treats so you have an exceptional vacation. Upgrade your room for further comfort and luxury then sip on a glass of sparkling wine paired with a delicious fruit tray. Head to the spa where you’ll receive 10% off on treatments and enjoy a romantic dinner for two on the beach. 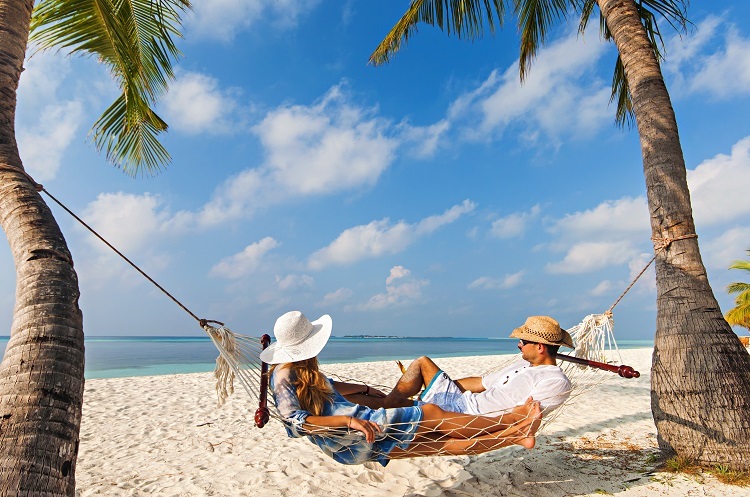 Along with these package inclusions, couples will experience warm island vibes for an exotic getaway. Between lush accommodations, savory dining options, and top-of-the-line service from resort staff, a honeymoon at Royalton Negril Resort & Spa is one-of-a-kind! Nothing is better than a luxurious honeymoon after a day celebrating your love with family and friends! 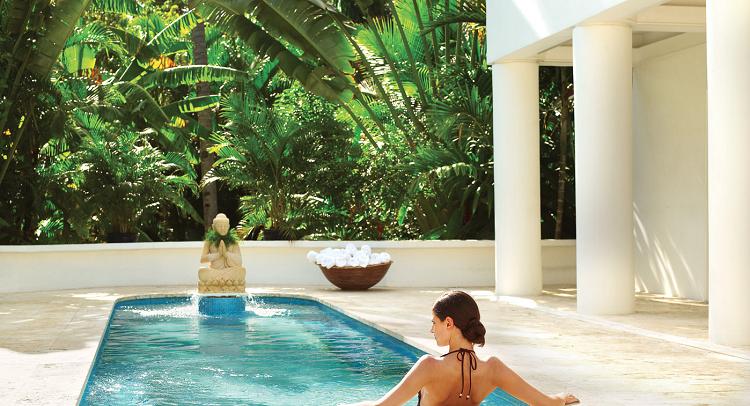 Iberostar Grand Hotel Rose Hall in Montego Bay wants couples to feel like they’ve stepped into a dream-like paradise. Premium rooms and suites welcome them to unwind after all the wedding chaos. Spend a night in with 24-hour room service then set the mood with calming aromatherapy. Throughout your stay, immerse yourself in a lover’s paradise on the white-sand beach or in one of the resort’s Jacuzzis. Enjoy total relaxation together with a visit to the spa where a variety of couples massages and treatments are offered. When the sun goes down, tropical vibes heighten the romance for a truly remarkable time. Couples who honeymoon at Secrets St James Montego Bay will delight in a serene beachfront paradise. As you lounge under the tropical sun with your significant other, romantic moments will create an experience you won’t forget. The Secrets Eternity Honeymoon Package features special luxuries for couples to indulge in. Upon arrival, you’ll be welcomed with sparkling wine, fresh fruit, and flowers in your room. Throughout your stay, enjoy a 25-minute Tension Release Massage, private beachfront dinner one evening, your choice of a couple’s spa treatment, and more. Each moment of your Secrets St James Montego Bay honeymoon will be nothing short of amazing. Turn the romance up with a spectacular honeymoon package. Depending on what you’re looking for, you may find special touches ranging from upgraded accommodations, to private dinners on the beach and much more! The Oasis Spa Villa Experience at Couples Tower Isle will have you floating on cloud nine. Upon arrival in Montego Bay, your private transfer will take you to the resort where you’ll be welcomed with a cocktail and private in-villa check-in. Throughout your stay, you’ll have access to the ultimate spa experience. Enjoy quiet, cozy moments with your loved one in your private villa, plunge pool, or sun terrace. In-villa dining allows you to savor fresh, flavorful cuisine whenever you’re too relaxed to leave. Best of all, receive unlimited spa treatments every day to guarantee a truly laid-back time. Luxury has never felt this good! 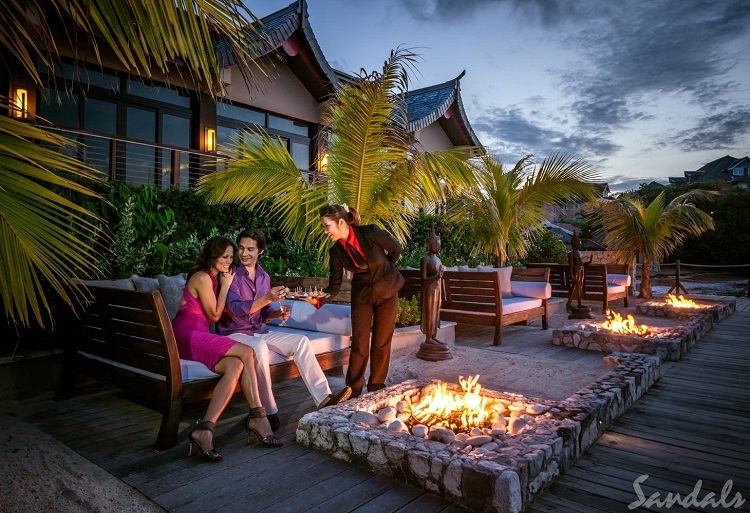 Romance in paradise reaches a whole new level at Sandals Royal Caribbean. Grab your loved one by the hand and retreat to your overwater bungalow for a serene escape. A two-person Tranquility Soaking Tub is the ideal spot for total relaxation as you look out onto stunning blue waters. Speaking of, you can also enjoy those sea views whenever you please through a glass floor in your bungalow. As if your stay couldn’t get any better, a personal butler will be available so you experience luxury at its best. Whether you’re looking to have a private beach dinner for two or want to lounge at the pool with refreshing drinks, it’s all taken care of. You and your sweetheart will be able to soak in every special moment together for a dreamy honeymoon in paradise! When you choose to honeymoon at Zoetry Montego Bay, you’re in for a secluded seaside getaway. With only 49 guest suites, this resort creates an intimate vibe for couples celebrating their love story. The Art of Romance Honeymoon Package is something to rave about! On one night of your stay, you’ll be treated to special turn-down service with rose petals, scented oil bath, and your drink of choice. Unwind with a relieving couples massage, enjoy breakfast in bed or on the terrace of your room, and take to the beach for a romantic dinner with live music. Other package inclusions continue the honeymoon magic throughout your stay. Plus, your suite will serve as your own personal oasis whenever you’re looking for privacy and extra moments of romance. With so many things to do while honeymooning in Jamaica, it may be hard to choose which activities to enjoy while away. After all, relaxing in your suite and decompressing after the wedding is half the fun! But, if the adventurer in you is seeking some new sights, these exciting excursions are sure to fit the bill. Get a two-in-one experience to see Jamaica up close with a day spent at Dunn’s River Falls and Dolphin Cove! Your venture to Dunn’s River Falls will be something to remember. A knowledgeable tour guide will bring you to a scene of cascading waterfalls set among the vibrant greenery of Ocho Rios. You can climb to the top of the falls as well as take a refreshing dip in a natural pool to cool off. At Dolphin Cove, take the opportunity to interact and swim with friendly dolphins. Make a splash, steal a quick kiss, or glide through the water with the help of these beloved marine creatures. You’ll also be able to snorkel and swim with string rays, meet some of Jamaica’s exotic animals such as birds and snakes, and enjoy a cup of Jamaican coffee at the coffee shop. 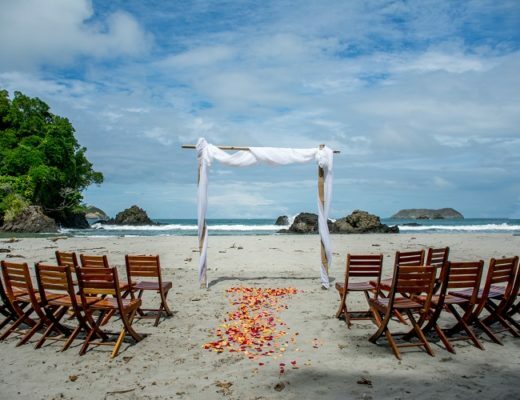 After all the planning, stress, and excitement from your wedding, a relaxing day on the beach may be necessary! The picturesque Seven Mile Beach in Negril is a great spot for honeymooners looking for quality time together while soaking in some rays. Enjoy a leisurely stroll next to the crystal-clear sea while digging your toes into powder-white sand. You even have options like kayaking, snorkeling, jet skiing, and glass-bottom boat rides to enhance your beach experience! 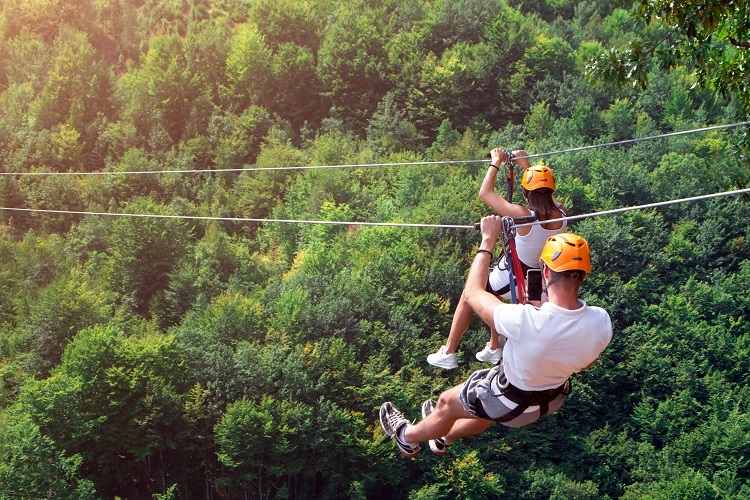 Couples looking to add some thrills to their honeymoon can find them on a zipline tour in Montego Bay! Companies like Jamaica Zipline Adventure Tours and Island Routes offer different opportunities to soar through the sky and witness breathtaking views of the region. As you fly past lush vegetation, you’re sure to get a rush of adrenaline. After sharing an exciting day in the Jamaican jungle, you and your loved one can relax back at your resort with a couples massage or private in-room dinner! 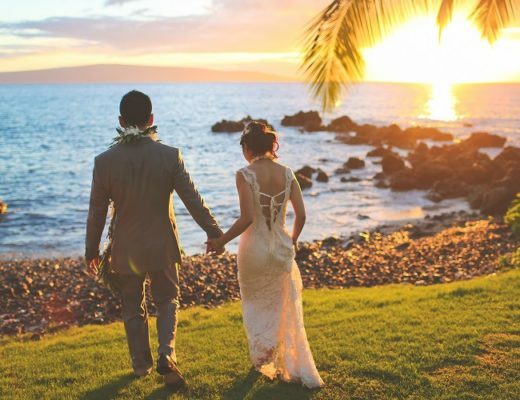 A Jamaica honeymoon just as memorable as your dream wedding can be all yours with a few simple planning tips. Our Certified Specialists are here to help with all the details and find the best Jamaica honeymoon packages for your style and budget. Get started planning with us today!